Graham Masterton has a gruesome imagination. He put it to good use in his early novels. Tales of supernatural terror like The Manitou, The Djinn and Charnel House. These were classics of the 1970s boom in horror literature, found on the bookshelves alongside Stephen King, Dean Koontz and Peter Straub. His latest novel, White Bones, was originally published as A Terrible Beauty in 2003 but is now available as an ebook from Amazon. Masterton continues to play with the idea of demons and spirits but this time the supernatural themed adventure begins as a detective story when a huge quantity of human bones are unearthed from beneath an Irish farmhouse. Detective superintendent Katie Maguire has the task of solving this eighty-year-old mystery, the ritual dismemberment and burial of eleven women. Katie tugged on a tight plastic glove and accepted one of the bones. It had been pierced at the upper end, where it would have fitted into the hip socket, and a short length of greasy twine had been tied through the hole. Naturally, one cannot be a detective in fiction without harbouring some demons of your own and for Katie this literary trope originates in the death of her child, the story of which leaks out piecemeal in the first half of the book. This would be enough to hamper most detectives but Katie Maguire has a more urgent problem firmly rooted in the present, Paul, her wheeler-dealer boyfriend. Paul is in big trouble with a local gangster having stolen not only some building materials but also, for one night at least, the gangster’s girlfriend. As a female I have no idea what Katie sees in him. But, that aside, it makes for an interesting situation with danger at every turn. In the end it doesn’t matter whether you die at the hands of gangsters, serial killers or Irish demons, you’re still dead. He turned left up a steep, winding hill, where the nettles and the brown-seeded foxgloves crowded even closer. At the top of the hill there was a sagging five-bar gate, every bar still bejewelled with raindrops, and beyond that stood a damp-looking cottage with one side thickly shrouded in creeper. Southern Ireland is the perfect setting for a horror story. Graham Masterton knows the area well and brings together many different strands, its distinctive landscape, quirky characters, criminal underworld, postcolonial past and supernatural heritage to good effect. The story is always moving forward, Katie Maguire being dragged this way and that in her quest. And then there is the killer. And the gore. And what seemed at first to be an historical mystery turns into something much more horrific as we see the murderous ritual being enacted on a poor hitchhiker who was lured into a car by a smile and that fabled Irish charm. She was beginning to feel a genuine sense of dread. This wasn’t just butchery. This was deeply rooted in the Ireland of legend and mysticism – the Ireland of evil fairies and gray shadows that hurried through the rain, and white-faced mermaids who sat on the rocks and screamed and screamed until a man could go mad. How does all this work out? It would be unfair to tell. But if you have read some of Graham Masterton’s early works, you might want to try some of his more recent fare. I enjoyed it as a dose of good old-fashioned horror and I don’ t mean that in any derogatory way. Story used to be everything and Masterton has never forgotten that. My only regret is that White Bones doesn’t have one of those wonderful covers from the 70s. 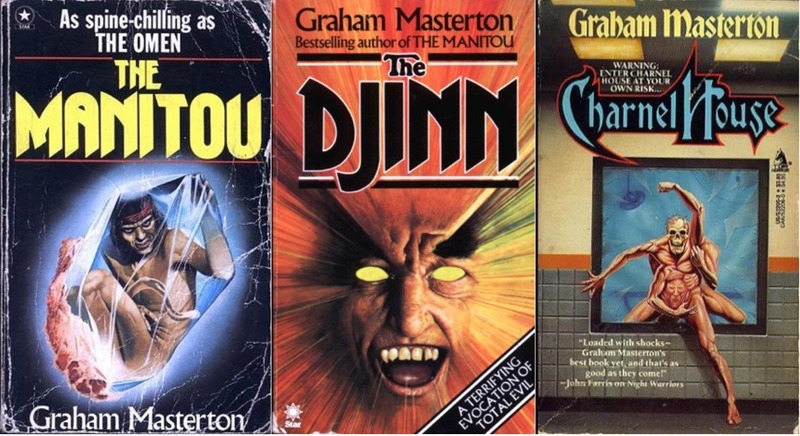 I wasn’t around at the time these books were originally published but if, like me, you relish these garish covers you can do no better than visit Will Errickson’s Too Much Horror Fiction blog where you will find gorgeous book covers aplenty. Meanwhile, check out Graham Masterton’s White Bones on Amazon. I got the Kindle edition for a mere 85 pence. Bargain!